Over the years, great strides have been made to ensure a level playing field between men and women, especially in education. But sadly, gender equality is one way that the technology world lags far behind. While tech news may be dominated by those possessing Y chromosomes, the contributions of women to the technology space remains mostly unheralded…until now. 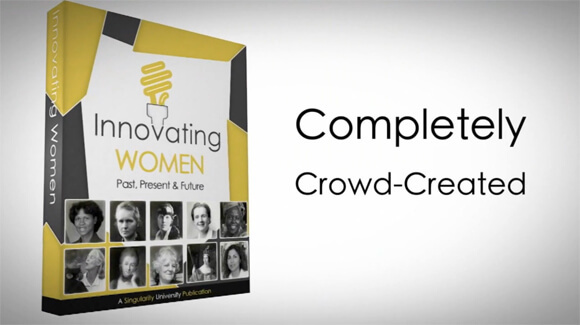 Singularity University and Google recently announced the launch of a campaign to crowdsource a book titled Innovating Women: Past, Present, and Future. The project is being crowdfunded on Indiegogo with a dollar-for-dollar contribution from Google for Entrepreneurs up to $50,000. The book aims to collect stories from women around the globe and bring together their perspectives about a variety of factors that are shaping the innovation economy. By incorporating their unique perspectives and personal stories, the tome will both record the contributions women are making in the world today as well as provide an inspiration to female entrepreneurs around the world. A website has been set up to collect stories from women who are interested in sharing their stories at innovatingwomen.org. It’s no secret that technological innovations are happening all over the world, and the web has become the primary source for people to become informed about what is happening. However, it’s also clear that in this surge of information, important stories and trends have been washed aside, which has included the significant contributions women are making. The proposed book is a great start at both capturing those stories and springboarding a platform for greater awareness of women in technology. And hopefully, we’ll start to see the impact on the tech world’s front page.